For a thorough and high-quality clean, you need a thorough and high-quality mop service. Why throw away your mops and your money? 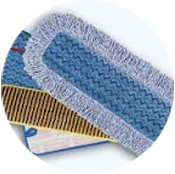 American Wear’s line of treated dust mops and wet mops that are rented keep your facility clean and safe. 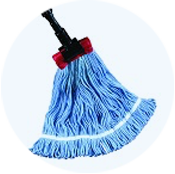 Our mops are less expensive than disposable products and are professionally treated and environmentally friendly. Make your workplace spotless. 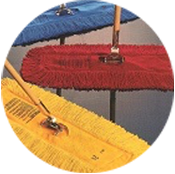 To find a mop that fits your needs and your facility – mop sizes range from 18″ to 60″ – contact us for more information. Your mop inventory is managed by your route representative each week. During regularly scheduled deliveries, your representative will exchange your soiled mops with clean, sanitized and treated mops. Because our mops are reusable, together, we’re helping reduce the amount of waste in landfills and promoting a “greener” environment. We are amazed by American Wear! Everyone is friendly and accommodating and our team has not changed in the six years that we have been a customer. John promised me great service, complete deliveries and personal attention without any hidden fees. He has lived up to his word for 12 years! We are American Wear fans. Our group thanks American Wear for their generous donation of aprons for our soup kitchen. We use them every time we are there. Not only are they practical but they are also beautiful. We are very grateful. Dominic and Steve are a great team as our route rep and district manager. There are never any problems and if we need anything they are more than happy to oblige us. ©2019 American Wear. All Rights Reserved.